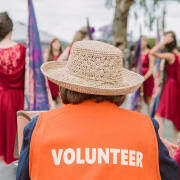 The Balboa Park Conservancy proudly partners with the City of San Diego Parks and Recreation Department to welcome and inform our Park visitors through our volunteer Park Ambassador program. Park Ambassadors are on the front-line, greeting visitors and offering current information acting as the eyes and ears of the Park. Join our team and you’ll have a great reason to spend more time in beautiful Balboa Park!